The scholarship recipients and finalists enjoyed their retreat, which included tech talks, workshops, career panels and social activities and provided an opportunity to network with other women in technology-related fields. One of the scholarship winners, Janina Voigt, told me, "It's been a great experience to meet people with similar views of issues we all face as women in this industry - we're all girls going through the same thing right now. It has also been great to share ideas and participate in the workshops." The scholars are studying a wide variety of disciplines and talked openly about their projects, inspiring and learning from each other. Shaoqun Wu shared how she's creating a system to assist with second language learning. Having moved to New Zealand from China seven years ago, she understands what it's like to learn a second language first-hand. Her project has been funded by the New Zealand government, and she hopes to continue developing her career around this area. During the retreat, she emphasised how important it is that women in IT connect and help one another. We also discussed how to encourage other women to enter the field of engineering and computer science. Sue Lynn Choy, a Ph.D. student in surveying, geomatics and cartography, told me "Studying computer science or other IT-related fields can be a big stepping stone to other things. The possibilities are only limited by your imagination." On Friday we hosted our annual Anita Borg Scholars' Retreat at our Engineering Centre in Sydney as a way for women to come together and share their experiences as leaders in the field of computer science. 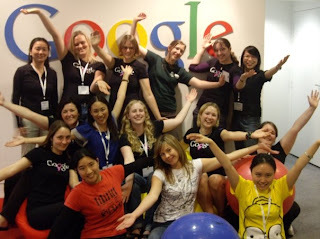 The Google Anita Borg Memorial Scholarship started in the United States in 2003 in association with the Anita Borg Institute for Women and Technology to honour the legacy of Anita Borg and her efforts to encourage women to pursue careers in computer science and technology. Australia became the first country outside of the US to launch the scholarship in 2006, and in 2007 we extended the opportunity to students studying in New Zealand. This year we received applications from women at 28 universities throughout Australia and New Zealand, and we're pleased to announce Andrea Schweer, from the University of Waikato and Janina Voigt, from the University of Canterbury, Christchurch, as the recipients of $5,000 scholarships for the 2009 academic year. With rising fuel prices increasingly factoring into our driving decisions, Australians are feeling our fair share of pain at the petrol pump. To help Australians get the best value for their fuel dollars, Google Australia has partnered with Motormouth to help provide everyone with easily accessible information about petrol prices. We've developed an iGoogle gadget (here) that allows you to find out the price of various fuel types across parts of major metro areas in Australia. You can quickly see the prices for your area in a list or on Google Maps. Prices are updated twice daily during the week and once on Sundays by Motormouth's scouts who report the prices from service station price boards. Currently, over 50% of metropolitan service stations are covered, which hopefully include a few near you. With the daily work of these petrol price scouts now accessible from your personalised iGoogle homepage, we hope this handy tool will go some way to keeping you informed and ensuring that you're not over-paying at the pump (note that prices can change at any time, except in Perth where they're locked for 24 hours). Of course, the best way to reduce your fuel bill would be to walk, cycle or catch public transport to wherever you're going. Google Maps and, in Perth, Google Transit, can help you with that. Now go and get the keys to the Cortina so you can move the Camira so Dad can get the Torana out of the driveway and fill up the Commodore. This gadget will pay for itself. Sites are organised by category. This will help you browse sites by categories that represent your target audience, such as finance, entertainment and technology. For example, if you sell rental cars, you might browse through the "Travel" category to see examples of relevant sites. Or, if your target is female, you can try the "female interest" category. Once you find a site that's relevant to your product or service, you can use placement targeting to target your ads to that site directly. We recommend you use the Placement Tool to help you with this. If your campaign is already running on the content network, you can see the sites where your ad has appeared by running a Placement performance report. For those of you targeting users in other countries, a drop-down menu lets you browse sample partner sites in countries in Europe, Asia, and Latin America. Our Australian advertisers often ask: "What kinds of web sites make up the Google content network?"
. An annual event run by Bravehearts, Australia's largest child protection advocacy group, White Balloon Day is a very important event during National Child Protection Week. White Balloon Day’s overarching message is to "Break the Silence on Child Sexual Assault" by raising awareness and by show of balloons, demonstrating community desire for Australian children to be safe. We've been working with Bravehearts to raise awareness of the day and encourage all Australians to buy special white balloons. We've been doing this by providing Google Grants, so that when Internet users search for relevant terms on Google, "Sponsored Links" for White Balloon Day appear alongside search results. We also created a special Google Maps "My Map", showing the Mowerthon journey of Claude Harvey, "The Lawnmower Man", as he mowed his way 850kms from the Gold Coast to Sydney to raise funds and awareness for victims of sexual assault for White Balloon Day. Google Australia and Bravehearts are committed to deepening their ties for White Balloon Day in future years, by using new media and technologies to educate families about how to stay safe online and raise awareness of the tools that empower families to control their activity online. We share Bravehearts' belief that new technologies and new media are a vital way to educate children and parents about family safety online. We hope to work together to help parents and kids take advantage of tools that help put them in control of their online experiences and make Web surfing safer. You can check out our Tips for Online Safety and Online Family Safety Guide for helping families stay safe online. These provide quick links to tools like Google SafeSearch and other resources. Google SafeSearch is a tool that allows users to filter unwanted content from their search results. (You can customise your SafeSearch settings by clicking on the 'Search Preferences' link to the right of the search box on Google.com.au). So please support Bravehearts, buy a white balloon today, and help break the silence. Today is White Balloon Day. An annual event run by Bravehearts, Australia's largest child protection advocacy group, White Balloon Day is a very important event during National Child Protection Week. White Balloon Day’s overarching message is to "Break the Silence on Child Sexual Assault" by raising awareness and by show of balloons, demonstrating community desire for Australian children to be safe. , and here) about a new tool called Google Insights for Search, a new product that allows advertisers and marketers to better understand search behaviour across the globe. Like Google Trends, you can type in a search term to view search patterns, and we've also included some interesting new features like a geographic heat map to graphically display search volume and regional interest. We figured it would be great to highlight some Australian-specific insights we've found using Insights for Search. Hopefully they'll stimulate your own discovery of other interesting online trends in Australia! As an example, if you perform a basic enquiry, leaving all the default settings and simply type [didgeridoo], this will show you search information from across the world, from 2004 to today. As you might expect, there is a lot of interest in didgeridoos here in Australia. But what you might not expect is the other countries with a large relative interest in didgeridoos, like Austria. If you were in the business of making fine, handcrafted didgeridoos here in Australia, you could build your international business by focusing your online advertising within the most relevant international markets: Austria, Switzerland and the Czech Republic. It's also possible to compare search terms by location, time range and category. With the Categories filter, you can hone in on results based on different categories. For example, you can enter the search query [the vines] and isolate results to the music category, to see interest in the rock band The Vines, rather than the WA resort. If you throw in a few more bands for comparative purposes, it's interesting to see how popularity is changing over time, and that great bands have peaks and troughs (often around album sales or tours)! [The Vines] peaked in early 2004, [Wolfmother] peaked in 2005/2006, but [Crowded House] continues to be consistently popular. It's also interesting to note which in which Australian regions [The Vines] are searched - as a proportion of total searches, they're most popular in Perth. Using the "Categories" filter, you can also see the most popular searches for an entire category, such as [basketball], where you can notice the huge spike in interest around the Beijing Olympic Games. A further use of Insights for Search is to see popular searches and rising queries, from here and abroad. An analysis, for example, of Australian vacation destinations that Germans are searching for, shows that Ayers Rock/Uluru and the Great Barrier Reef are popular destinations, with the Whitsundays and Tasmania rapidly increasing in popularity in the past 18 months. Businesses can further use Insights for Search by viewing search trends for over time. The seasonality of searches can be used to target advertising campaigns around events like Fathers Day or Christmas. Look at the spike in searches for [car stereos] in the lead up to Christmas. We hope you'll find Google Insights for Search to be an extremely valuable tool. Given the various methods of comparison, the ability to filter by category and visualise heat maps by region, hopefully you'll discover new and engaging information about your products, markets, and advertising! You may have read a few interesting articles (here, and here) about a new tool called Google Insights for Search, a new product that allows advertisers and marketers to better understand search behaviour across the globe.